Here is all you need to know about Nifty. In our previous post, we’ve discussed what Sensex is and how it is calculated. Just like Sensex which is introduced by the Bombay Stock Exchange (BSE), Nifty is also one of the major indices of the Indian stock market introduced by National Stock Exchange (NSE). In this blog, we will help you enhance your knowledge of the concept related to Nifty and importance. Nifty is the index of the leading stock exchange of India, i.e., National Stock Exchange (NSE). The word Nifty was coined from two words ‘National’ and ‘Fifty.’ The word fifty came into consideration as it consists the stocks of 50 companies which are listed on the National Stock Exchange. Normally Nifty comprises of 50 stocks, but right now there are 51 stocks listed in this index. It shows the aggregate performance of these 51 companies. When the overall market scenario goes upward, the Nifty also rises. Whereas, when the stocks do not perform well in the market and show a downward track, the benchmark measure of these stocks, i.e., Nifty, also shows falling scenario. There are only two major indexes of the Indian stock market which are Sensex and Nifty. Liquidity: To be included in the index, the stock should have traded at an average impact cost of 0.50% or less during the last six months for 90% of the observations for a portfolio of Rs. 10 crores. 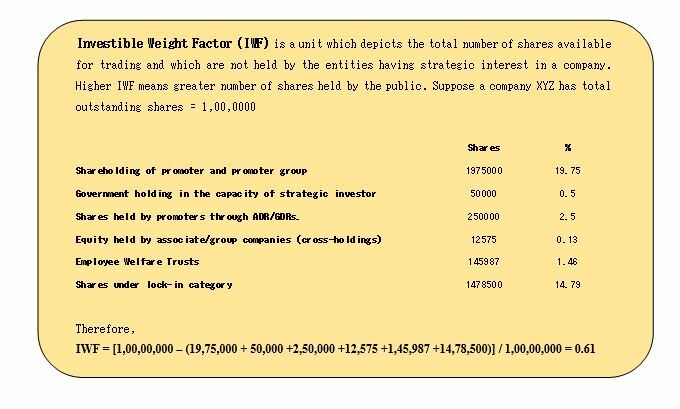 Float-Adjusted Market Capitalisation: The companies must have an average free-float market capitalisation of at least 1.5 times of that of the smallest constituent in the index. Trading Frequency: The trading frequency of the company should be 100% in the last six months. Domicile: The company must be domiciled in India and listed on the NSE. 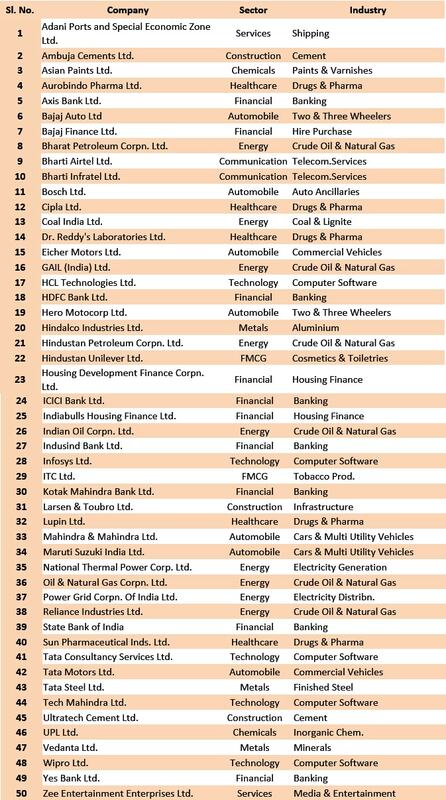 All the companies which are mentioned in the table above are currently included in the index NSE. Let’s move on to the next step to understand the calculation of the Nifty value. Where, the base market capital is the average market capitalisation of each stock in the index during the base period, and the market capitalisation during the base period is equated to an index value of 1000 (known as the base index value). What Is the Difference Between Sensex and Nifty? Generally, there is no such difference between Sensex and Nifty. The former one represents the index for Bombay Stock Exchange (BSE) and the latter one for National Stock Exchange (NSE). You may hardly find any difference if you see the performance of both for the past 20 years. But still, if you are looking for some difference between both of these indices, Nifty is broader index than Sensex as it has 50 stocks listed under it as compared to the 30 stocks of Sensex. Moreover, the former one has more diversified portfolio than the latter one because of having more stocks listed under it. Last but not least, more trading happens in NSE as compared to BSE. Henceforth, we hope that you now have understood the meaning of both Sensex and Nifty. The value of both Nifty and Sensex shows the average scenario of all the stocks which are listed under them. So, you can easily track the market value to know the scenario of the mutual fund in which you have invested. For example, if the value of Sensex is showing an upward move, it means the average market of the 30 stocks which are listed in it is growing, which further means that you are gaining profits if you have done online mutual fund investment with any of those stocks in your portfolio.